After the 2013 release of their EP ‘Melody Calling’, fans of The Vaccines were left scratching their heads and wondering what would come next from the West London rockers. The band took a sharp left turn with the last EP, veering away from the adrenaline-fueled rock of their first two albums and more toward a psychedelic American West Coast sound. 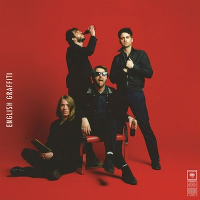 On their latest album ‘English Graffiti’, The Vaccines seem torn between the old style and the new, and while they execute both remarkably well, each new track on the album feels like a coin flip: you never know if you’re going to get fast-paced punk rock or hazy, dreamy synth pop. I suspect that the dual nature of ‘English Graffiti’ might stem from the fact that The Vaccines chose to work with two different producers. Production credits on the album are shared between Dave Fridmann (The Flaming Lips, Mercury Rev), who recorded the album at his own Tarbox Road Studios in upstate New York last year, and Los Angeles electronic musician Cole Greif-Neill, also known as Cole MGN. While Fridmann’s elaborate sonic approach is easily heard in the more typically bombastic early singles ‘Handsome’ and ‘Dream Lover’, the album also includes an intoxicating ballad written by Greif-Neill, titled ‘(All Afternoon) In Love’, which exemplifies the other side of the album’s coin, showcasing frontman Justin Hayward-Young’s delicate falsetto in a very pleasantly unexpected fashion. Listeners who have connected with the raw punk rock sound of ‘Handsome’ and the dramatic guitars in ‘Dream Lover’ might be taken aback by the current single ‘Minimal Affection’, whose theme of cultural detachment and impersonality is driven more by synths and bass, almost in the vein of ’80s dance pop. But those listeners will be assuaged by the hooky guitar riff of ‘20/20’ and the breakneck pace of ‘Radio Bikini’, as well as bonus track ‘Miracle’, which appears on the deluxe version of the album. Getting back to the album proper, a pair of its songs are notable for their combination of The Vaccines’ two seemingly dichotomous styles. The echoing chorus of ‘Denial’, “please don’t turn the light out / I don’t think the conversation’s over / don’t just let your eyes close / not until I get it off my chest”, layers ’60s style vocal harmonies over aggressively gritty guitars. ‘Give Me a Sign’ grows from the pensive, introspective questioning of its verse lyrics to a powerfully anthemic pleading chorus before the album trails away into its closing instrumental track ‘Undercover’. ‘English Graffiti’ might not be exactly what any of us expected from The Vaccines, but it does mark a deliberate evolution of their style. Continuing with the sonic experimentation they began on ‘Melody Calling’, the band have clearly gained confidence in their abilities, even if they haven’t come to a definitive conclusion about which direction they want to pursue. ‘English Graffiti’ is available now on Columbia Records. The deluxe version of the album is worth a listen for the sheer number of added features, which include four bonus tracks, ‘Miracle’ and the eponymous guitar ballad ‘English Graffiti’ done acoustically among those. It also contains four ‘Reimagined’ tracks: remixes of ‘Handsome’, ‘Dream Lover’, ‘20/20’ and ‘Give Me a Sign’ engineered by Fridmann, Malcolm Zillion, and Co Co T.
Previous TGTF coverage of The Vaccines, including their scheduled November 2015 tour dates, can be found right back here. Album Review: The Vaccines – What Did You Expect from the Vaccines?